The #GalaxyS5 has proven to be one of Samsung’s most reliable flagship phones for years now. Even with the near arrival of the Galaxy S8, millions are still using the Galaxy S5 at this time so it’s no wonder that we’re getting a lot of requests for assistance. Solution: Hi Kellie. The only thing that you can do right now is submit the phone for a repair. Let a professional open the phone and clean the internal components. If you’re lucky, once the phone has been cleaned and dried up, you may be able to use it again normally. Keep in mind that water damage can lead to all sorts of issues. The main issue you’re facing now may be a bad screen assembly, but if some moisture remains inside, that could lead to corrosion of the motherboard, which can then lead to other problems. This is the main reason why a wet phone must be opened up, cleaned, and dried properly. If you have the skill and tools to do the job, you may be able to find some websites that specializes in hardware troubleshooting and repair. Do some research using Google for guides on how to do it. Otherwise, just bring the phone to a repair shop. My Galaxy S5 was working just fine until I rooted it. After I rooted my phone, it sometimes read my SD card. Every time it stops reading it, all I had to do was put my phone off and on. By the time it came back on, the problem was solved. Now all of a sudden my phone stop reading my SD card, so I try another SD to see if it was my SD card that was the problem. It turns out that it was my phone that was the problem because it was unable to read any memory card and all the memory card I used on it was working perfectly. Now I unrooted my phone to see if that was the solution but to my disappointment it was not. My phone sometimes shows that the SD card is present but when I try and send something on the SD card, the SD card disappears. When ‘Samsung Galaxy S5’ appears on the screen, release the Power key. An issue like this can also be caused by a bad SD card slot. If factory reset won’t help at all, have the phone repaired or replaced. Hi. My Samsung S5 randomly wouldn’t charge the other day. I took out the battery and held down the power key for 1 minute then put the battery back in, and while turned off it charged very slowly (but very glitchy, sometimes it didnt work). That worked (sort of) for a few days but now it won’t even charge while turned off. If i plug it in while turned off, the battery bolt symbol will show up for about 10 seconds, then it will disappear and the caution sign (or whatever it’s called) will appear. Solution: Hi Grace. 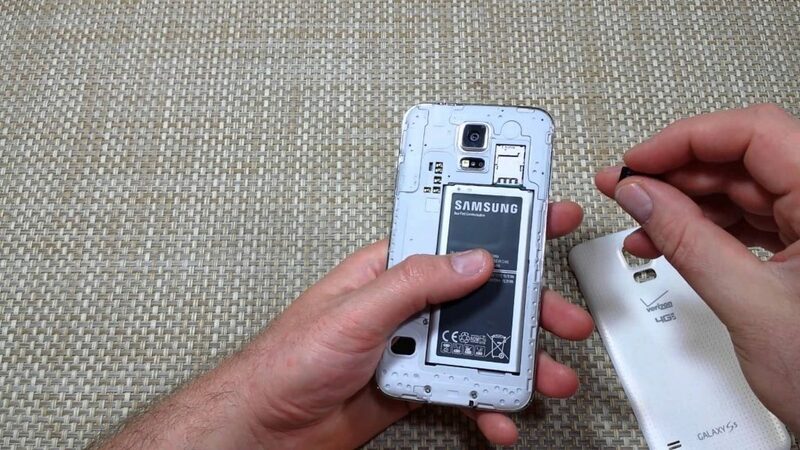 The first thing that you want to do is to try another original Samsung charger. The current charger may not be working properly at this time, leading to erratic charging sessions. If that’s not that, the problem can be caused by either an unknown software glitch, or a hardware malfunction such as a faulty USB charging port or battery. If you have a spare S5 battery with you, try using it to see if it has something to do with the battery. If you don’t have a spare one, just skip directly to software troubleshooting. That said, you must try the usual dose of software troubleshooting that we suggest. For your case, you must do the basic three — wiping the cache partition, charging in safe mode, and factory reset. If you’ve done them already prior to contacting us, the most likely cause is a bad USB charging port. Try to check the USB port using a magnified to see if there are bent pins or dirt inside. Wear and tear from regular plugging and unplugging or a charging cable can damage the USB port over time. If you’re not careful when plugging or unplugging, you can almost always expect a charging issue sooner. Dirt can also cause charging problems from time to time so make sure that the USB port is cleaned. Try using compressed air to blow particles out of the port. If doing these things won’t fix the problem you must either consider repair, or getting a new smartphone. I just got a Galaxy S5, having previously owned a Galaxy S4, until it decided to fly out of my hand down some cement stairs, never to work again. Anyway, I use the Do not Disturb feature (or Blocking feature I think it was) on the S4 and it worked fine. Coming out of blocking mode into the sound mode, it had been before it went dark (eg if it had been on vibrate when it went into blocking then it came out of blocking on vibrate as well.) I use this feature most nights on a schedule so I am not awakened by notifications when sleeping. However, the S5 seems to come out of Do not Disturb into full sound, even if it went into do not disturb on vibrate. I am not sure if this is a bug or if I just can’t find the setting to keep it on vibrate. Solution: Hi Paula. There’s no setting under Do not disturb menu to select vibrate when it deactivates so it’s most probably a bug. Try wiping the cache partition to refresh the system cache and try again. If that won’t work, consider wiping the phone via factory reset. Hi. My Samsung Galaxy S5 was fully charged and the problem starts when I power off my phone. Later the day, when I power on my phone, the Samsung logo was lacking. Next, the phone just stuck on the T-Mobile logo when it appears. I waited a long time, nothing happen, it just got stuck. I searched the websites, they said that I have to factory reset. So I did, now the problem continues. My phone did turn on and after the updates, the welcome screen appears, the one where you have to select languages, set up your WI-FI and stuff. Solution: Hi Cici. If factory reset did not make any difference, we doubt there’s anything else that you can do on your end at this point. The cause of the reboot issue may be a hardware malfunction so you must try to have the phone checked by Samsung or a third party a shop. Before going to the service, try to see if you can boot the phone to Odin mode. If you can and it stays stable, you may be able to fix the issue by flashing stock firmware. If you haven’t tried this before, use Google to find a guide. If the screen remains black or unresponsive after trying all three alternate boot modes, you can assume that the screen is not working at this time. Send the phone to Samsung or to a good third party repair shop so it can be repaired.